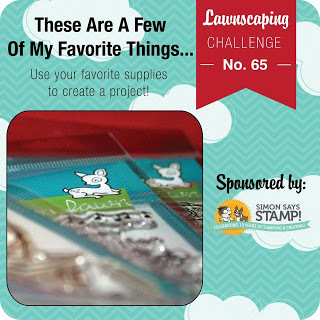 This post is getting squeezed in just in time for the Lawnscaping challenge "Favorite Things". I have been waiting 14 days for my newest Lawn Fawn products to arrive, and they came in the mail today... just in time! I know I've only owned these stamps for 4 hours, but I know they are my FAVORITE Lawn Fawn stamps in the history of ever. The adorable little Yeti was the first one I inked up. I also made my first ever shaker card (which are a favorite, but I've always been too afraid to try for myself!). You can't say no to a hug like that! I also need to share why this is part of my 'favorite things'... I have great memories of my dad and I at Disneyland. He assured me that the Matterhorn was the best ride in the entire park, and we'd get to see the abominable snowman. Well we rode the ride over and over again and went on each of the different tracks until we got to see him. There is nothing like being in Disneyland with your daddy and screaming at the Yeti!! ETA - Linking up to the Paper Issues "Say it ain't snow cold outside" linky party! I love these sequins so much! This is such a fun card, I love that yeti! Amazing job! such a cute idea. Love the sequins!! Your shaker card is adorable. I love shaker cards too but as you say there are some tiny technicalities involved!! Aw, I really love this card so much! I think you did a great job on your shaker card! I've been wanting to try a shaker card but just haven't gotten around to it yet. This card makes me want to make a shaker card! Awwwwwww...sweet story behind your adorable card!!! Gotta love the sequin shaker!!! ADORABLE! Love your story of finding the yeti with your dad. Making memories is what it's all about!!! I absolutely love this SUPER CUTE shaker card! Love, love, love. I mean, the color palette is freaking gorgeous, and seriously what is cuter than a Yeti in earmuffs? Totally love it. In fact, think I need to start following your blog. Love your style! Thanks so much for playing with us at Lawnscaping! ADORABLE!! Your shaker card is awesome, Rachel!! Holy amazing Batman! I love everything about this Rachel :) So super cute!! Absolutely LOVE this! Thanks so much for playing with us at Lawnscaping! Love that shaker card with the sequin snow - a perfect way to use them w/o having to adhere them to something which is the reason I have yet to used sequins!! The Yeti with the warm earmuffs is too cute!